The other day I was driving to work after skipping breakfast. Because I am what I and my family affectionately refers to as a “Diabeto”, it was necessary for me to eat on the road. I grabbed a peach purchased at Margerum’s Herbs at Clark Park (43rd and Baltimore Ave.) and was on my way. I feel the need to mention that I was wearing a newly purchased dress shirt. As I hit 95, I fished into my lunch bag and pulled out the aforementioned peach and proceeded to take a bite. This peach was so damn juicy that by the time I arrived at work, my new shirt was peached and my hands were sticky and my face was sticky and it was dumb to skip breakfast at home. Peach was good though, really good. 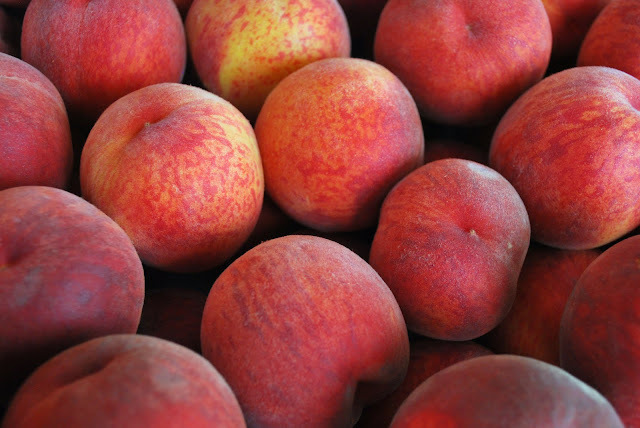 Equally as good was the peach I sampled at the Oxford Valley Farmers’ Market (900 E. Howell St.) last Thursday from Eden Farms farmer Joe Christophel. I was privy to the first peach of the market and it was like biting into a pitted piece of Heaven. I made sure I told any customer I saw and probably sold a few peaches myself that way. The Headhouse Farmers' Market (2nd and Lombard St.) is not immune to peach fever. I made sure to stop by and see my old friend Ben Wenk at Three Springs Fruit Farm. After biting into the first one of the many yellow peaches I brought home, I remembered why I frequent his stand throughout the summer. When the doughnut peaches come, I camp out like they are Dylan tickets. Nobody camps out for tickets anymore, but you get the point. So I guess the point here is that peaches are everywhere. And for those on a health kick, peaches are a great source of Vitamin C. Taste good and good for you. Peachy! I think he said one or two more weeks till Donut Peaches make their entrance this season... I, too, had a way juicier than expected peach experience today. As much as I like peaches, for me they don't seem to supply enough of an ooomph whenever my own blood sugar gets low. The same with blueberries and I tell ya; I used to dream about blueberries!